Two separate images posted on Weibo show that the Xiaomi Mi Mix 3 will have a motorised camera and an edge-to-edge display. The leaks regarding the Xiaomi Mi Mix 3 have started to pick up pace. In the latest development, Xiaomi has confirmed (Via GizmoChina) that the Mi Mix 3 will feature a whopping 10GB of RAM and will also be 5G enabled. 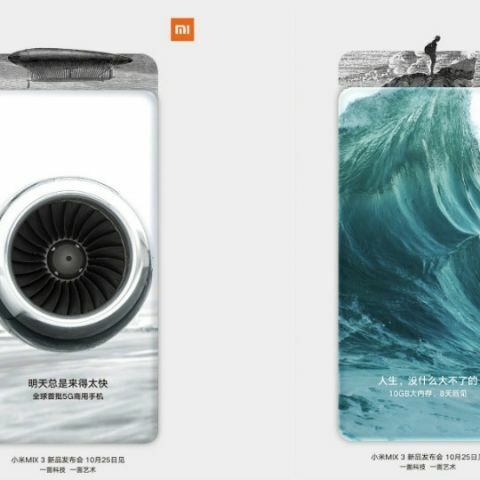 Teaser images shared by the company on Weibo suggest a number of features that the Mi Mix 3 might come with. In one of the two images posted on the Chinese microblogging platform, we can see “5G” written which confirms that the Mi Mix 3 will be 5G ready. The other one shows “10GB” written on it, which most likely implies that the smartphone will have 10GB of RAM. Apart from this information, both the images show completely bezel-less devices with an Oppo Find X-like mechanical camera module that will rise up when a person needs to use the cameras. The news comes a day after Xiaomi’s Global spokesperson, Donovan Sung, posted an image on Twitter showing two notebooks with “5G” and “10G” written on it. It is said that the smartphone will come with the Face Unlock feature and an in-display fingerprint sensor. We’ll have to wait till October 25 to get an official word on the smartphone when it launches in China. Previously, the Mi Mix 3 was reported to be powered by a Qualcomm Snapdragon 845 SoC with up to 8GB RAM and 256GB of onboard storage. But given the recent teasers, it may come in a 10GB variant. In the camera department, the Mi MIX 3 may sport a 12MP + 12MP vertically-aligned dual-camera system and may have a 20MP front shooter. When it comes to the software, Mi Mix 3 may run MIUI 10 on unidentified Android platform which is likely to be the Android Pie 9.0.